Think about it for a minute….does physical fitness matter to God? Our culture has now become a sedentary society. In this age of technology, we have lost the need to physically work hard for our livelihood. Now, most jobs require us to sit at a desk glued to a screen. With this shift in the physical aspects of our jobs, it has also, brought about a shift in our physical fitness levels, obesity rates, and a mind set of physical laziness. Now, we have become a society that does not appreciate hard manual labor or even physical activity for enjoyment. Think about it, now we sit ourselves and our families in front of the television to be entertained by movies or games instead of playing games or running around outside. Enjoyment or relaxation comes in the form of sitting around mindlessly doing nothing. But the real question is do we really care about our level of physical fitness? But here is an even greater question, does God care? As a matter of fact, I think He does more than we wish to think. Getting physically fit is not about what I look like or what the scale reads every morning, it’s about being strong and having endurance so we can stay engaged in the spiritual battle. Let’s look at some verses and see what the Word of God says in regards to our physical body. Deuteronomy 6:4-5, Hear, O Israel: The Lord our God is one Lord: And thou shalt love the Lord thy God with all thine heart, and with all thy soul, and with all thy might. Mark 12:30- And thou shalt love the Lord thy God with all thy heart, and with all thy soul, and with all thy mind, and with all thy strength; this is the first commandment. Luke 10:27, 28- And he answering said, Thou shalt love the Lord thy God with all thy heart, and with all thy soul, and with all thy strength, and with all thy mind; and thy neighbor as thyself. And he (Jesus) said unto him, Thou hast answered right: this do and thou shalt live. Both the Old and New testament give a clear picture of the christian’s walk as a whole. We are made up of body, soul, and spirit. We need all of them engaged. God gave us souls, but they have bodies to go with them. All three work together to bring glory to God. If we are only focusing on spiritual issues in our lives and not the physical, as well, are we less useful in the ministry that the Lord has given us? Sadly, when we neglect any aspect it creates an imbalance in our spiritual walk. One thing I have learned over the years is that the spiritual can manifest itself physically and, likewise, the physical can manifest itself spiritually. They go hand in hand, but for years we have tried to separate them to no avail. Our bodies are designed to be physically active. I believe we have tried to disconnect our physical bodies from our spiritual lives and it is weighing heavily on our christian walk and we do not even realize it. Holiness requires total engagement of our every part of our being. The physical and spiritual are intertwined with one another. In this life, they cannot be separated. 1 Thessalonians 5:23- And the very God of peace sanctify you wholly; and I pray God your whole spirit and soul and body be preserved blameless unto the coming of our Lord Jesus Christ. Again, let’s think on these verses and consider God’s thoughts on our physical fitness and shift our thinking to a stewardship mentality. God has given us these bodies. What are we doing with them? Are we being a good steward of the body that the Lord has provided for us? In my own life, I have noticed a pattern when it comes to my physical being. If I get lazy with my physical body or physical fitness, it creates an attitude of undiscipline in every other part of my life. Even my strong habits start to loosen up. It is like I have given Satan a little tiny foothold on an area of my life and he runs with it trying to take down every thing he can. Then pretty soon I am so wrapped up in myself that I am rendered ineffective and disengaged from the battle. We need to understand that our physical fitness has a huge impact on our overall sense of well being. Physical activity affects our minds and bodies in so many ways. Our energy levels increase, our oxygen levels go up, our mood changes and we start to feel alive. Don’t get me wrong, we absolutely need to have our spiritual disciplines in place. We need to be in the Word daily and have constant communication with our Father through prayer, but the effectiveness is magnified when we add the physical disciplines into our daily lives. I want to be a good steward of all the blessings that God has given me. If I truly take a good look at my life I notice that my physical being effects every area of my life as a steward. If I am physically fit, I am prepared for whatever the Lord is calling me to do! Our bodies are not just flesh and blood, they are the dwelling place of the Holy Spirit. 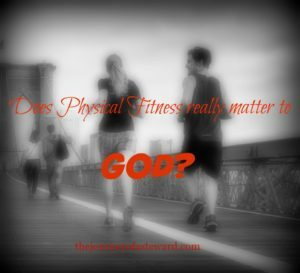 1 Corinthians says, “For ye were bought with a price: therefore glorify God in your body, and in your spirit, which are God’s.” And what if, exercise and discipline of our bodies isn’t as much about physical health as it is about honoring the God who made us? One thing I think I need to add here, is that we need to have balance. Fitness can become an idol is our life just as quickly as anything else. Our goal is to be ready and able for the work and war God has for us and bring glory to Him. It is not meant to glorify ourselves and serve our flesh. Do you work to be physically fit? Are you ready for the Master’s use? Blessings today as you walk with Him!